UI Object that displays one or several labels. This object is typically used as an overlay for an image. If no data source is specified, a single label will be drawn in the center of the frame. If a data source is defined it will be used to set the center of one or several labels. The positions must be between 0 and 1 unless min and max are specified. labels: this type takes the labels from a comma separated list of strings in the variable text. x_value: the labels are taken from the x-coordinate of the input. y_value: the labels are taken from the y-coordinate of the input. z_value: the labels are taken from the z-coordinate of the input. 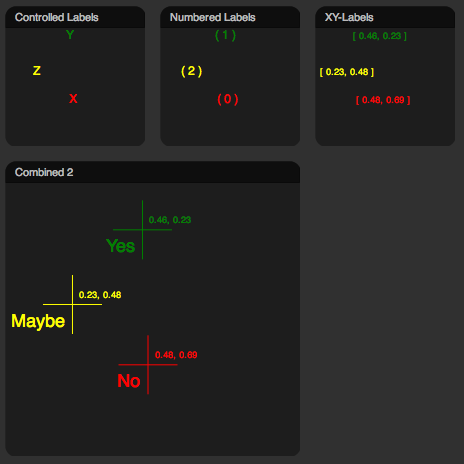 xy_value: the labels are taken from the x- and y-coordinate of the input. value: the labels are taken from the column of the input set by the select_value attribute. The different labels can be given different colors by specifying a list of colors or a color table for the color attribute. The text and position of the labels can be controlled using the parameters offset_x and offset_y that shifts the label away from the center. The text can be draw left, right or center-justified by setting the text_anchor parameter. The text size can be set using the size parameter. When the labels show a value, the number of decimals to use are set by the decimals-parameter. Example Label Objects. Top Left. Labels from the list "X,Y,Z". Top Middle. Labels or type numbered with prefix "(" and postfix ")". Top Right. Labels of type xy_value with prefix and postfix brakets. Bottom. Combination of one cross object and two label objects, the first of which uses a list "Yes,No,Maybe" together with text_anchor at end and an offset from the center. The seonc label object consists of coordinates (xy_value) at an offset. color = "red, green, blue"
type type of label (labels, alphabetical, numbered, x_value, y_value, z_value, xy_value, value) "labels"
color color of the Label(s) or list of colors "yelow"
text_anchor text anchor position (start, middle, end) "middle"